The Tea Street Band are back with a new song, an album announcement and a hometown gig to relaunch the whole thing. What is their thing, though? If the blissed-out soul of ‘Feel It’ – just released this week in all its instant grat’ gorgeousness – is anything to go by, whatever it is, is about to get bigger. By Alan O’Hare. Liverpool is in England, but not of it. It’s a well-worn line, that, and contains elements of truth and bluster backed up by the independent thinking the city is noted for and (for the most part) its progressive attitudes. 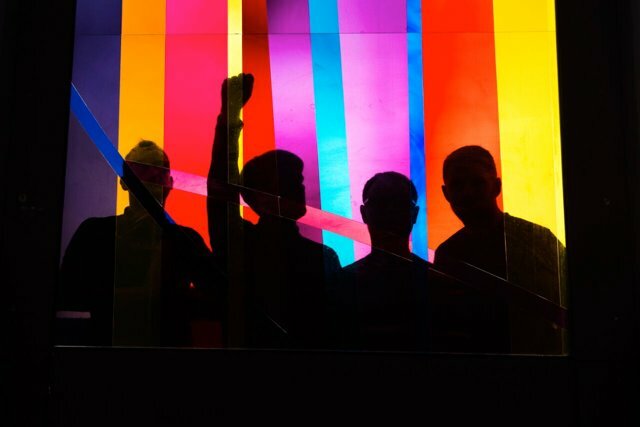 The Tea Street Band are progressive, too, but also share a space with the likes of The Coral, The Lightning Seeds and Shack… they sound like the future, whilst making fans feel like the past. It’s quite a trick to pull off and one that suggests the music The Tea Street Band make is in Liverpool but not of it, too. There’s not a strummed acoustic guitar to be heard in their blissful electronica and you’re more likely to jump up and down at one of their gigs than stroke your chin in admiration. Formed from the ashes of The Maybes?, and in particular in the startling response to cult Liverpool classic ‘Promise’, The Tea Street Band are closing in on a decade together and gearing up to release their second album, ‘Frequency’. It’s ‘Feel It’ that has got toes tapping and tongues wagging, though. Riding in on a, well, ride-assisted groove, the tune is a blissed-out belter that will soundtrack what’s left of your summer. “When is the time, to start believing,” runs the far-away refrain that’ll you be singing along to immediately and The Tea Street Band set their stall out as this generation’s answer to the prayers of acid house-loving forty somethings. It’s not all nostalgia, and in among the 808 State and Doves comparisons, you can hear the strange brew of movements being mashed together with melody still sitting high on the hog. I watched The War On Drugs live in Liverpool a few years ago, just as they were on the cusp of selling records and signing to Atlantic, and something hit me: the kids in the crowd, hundreds of ’em, were waiting on Adam Granduciel’s guitar solos just like people partying around the pool in Ibiza wait on the drop. The rub? The Tea Street Band have been lost in that particular dream for years. Let’s hope ‘Frequency’ finds the ears it deserves.